Recently, we visited Belgium with our two adult sons. While the big boys went after the Belgian beer, Phyllis and I played tourists. We shopped and kept an eye out for delicious chocolates and frittes, although not necessarily in that order. The frittes were easy to find—pick a street corner. But, settling on a chocolate shop of my liking came down to two things. How short was the line at the counter and if the free sample made me cheer then I knew I was in the right place. Frankly, the several glitzy Belgian chocolate shops we visited seemed to be all décor. It made me yearn for the simplicity of See’s back home. Yes, I like See’s candies. But we were in Brussels. Finally, as it started to get late and chilly, we wandered off of Grand Place and adventured in to a short cobblestone streets named Rue al Buerre (between Grand Place and Eglise Saint Nicholas). There we ran the gauntlet of five chocolate shops (in one block) until I noticed Leonidas Fresh Belgian Chocolates. I liked the word Fresh in the window sign and I liked they served espresso drinks at a sit-down counter. We were ready for a jolt of caffeine and grand chocolate after along day of appreciating Brussels by foot. Short and sweet. It was love at first bite. I’ve been a fan of Leonidas chocolates ever since. You can image our delight when we returned to California to discover a Leonidas chocolate store in our backyard. 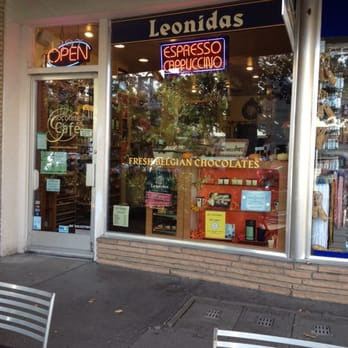 It's located at 1397 North Main in Walnut Creek, CA, one of only eight Leonidas stores in America. And, the only one west of Chicago. Plus, it is one of the few outlets only serving Weaver’s Coffee, an esteemed San Francisco coffee roaster. Double happiness as my fortune cookie informed me. 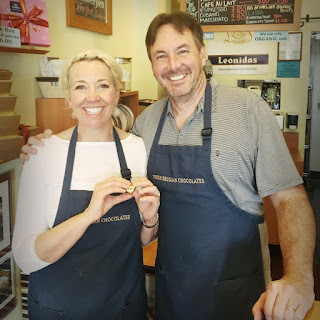 Kent and Kristy Lincoln just recently took ownership of Leonidas Chocolates in downtown Walnut Creek. Before that Kent was a wine buyer before becoming a stay-at-home dad to Abbie, 15 and Ande, 11). Kristy worked in corporate America for 21 years as a senior VP of Marketing. Together they decided to change their lives and live out their dream of owning a coffee and chocolate shop! They carry Leonidas brand Fresh Belgian chocolates. It’s the only brand of chocolate you’ll find in the small shop. 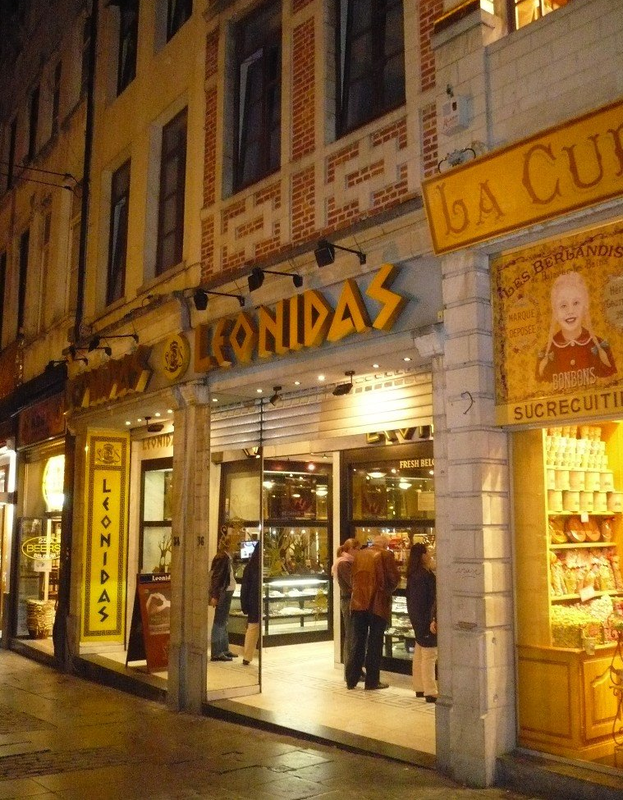 Leonidas is the number one brand of chocolates in Europe and they have over 2,500 stores world-wide. However, there are only 8 stores in the US and Leonidas ~ Love + Chocolate is the only store west of Chicago! They carry 90 different chocolates (dark, milk and white) and a variety of other European confections like marzipan, fruit jellies, marshmallow bars and petit fours. The chocolates are flown in fresh from Belgium. The store offers shipping. They are currently building an on-line store, but in the meantime you can peruse their offering on the existing website and call to place a phone order. The shop has a full Espresso bar and is proud to carry Bay Area’s Weaver's Coffee & Tea. John Weaver is the owner of Weaver's coffee and he served as the Master Roaster of Peet's Coffee for 20 years before starting his own business. You can reach Leonidas ~ Love + Chocolate shop via 925-932-6666. They take phone orders. 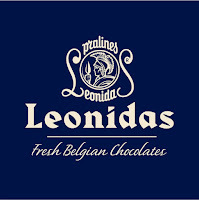 Or, find them on facebook by searching "Leonidas Chocolates, Walnut Creek, CA"
In 1910 Leonidas Kestekides confectioner in the US, travels to Belgium for the first time to show his confectionery goods, and immediately meets with great success thanks to the quality of his products. The young Greek Leonidas Kestekides, confectioner in the US since the early 1900s, attends the 1910 World Fair in Brussels and the 1913 World Fair in Ghent as a member of the Greek delegation from the United States. He is awarded the bronze medal and the gold medal, respectively, for his chocolate confectionery and his patisserie. Having won great professional recognition and having also fallen in love with a beautiful young girl from Brussels (whom he later marries) Leonidas decides to settle in Belgium. He opens tearooms in Brussels, Ghent and Blankenberge. 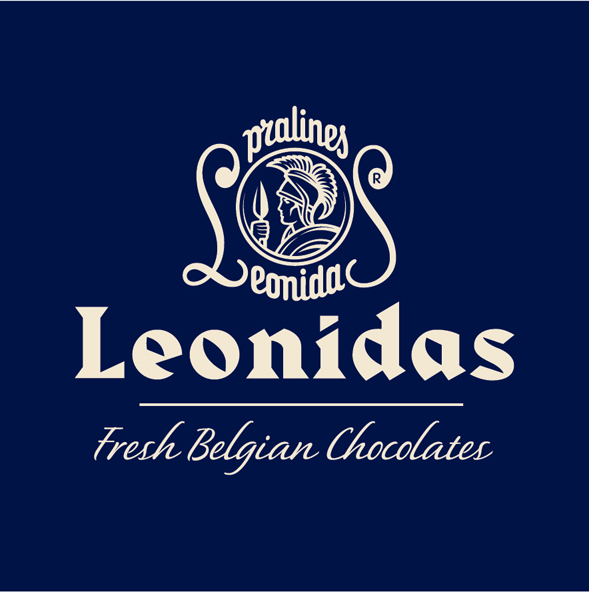 Leonidas now produces more than 150 different kinds of Belgian confectionery items sold in 1400 stores throughout more than 50 countries. Made according to traditional methods, Leonidas only uses natural ingredients like fresh butter and cream, including hazelnuts from Turkey, Morello cherries from the Périgord, almonds from Italy, and walnuts from Grenoble. Leonidas gets their cacao beans from Ghana and the Ivory Coast. The African supplier of the beans is a member of “The Sustainable Cocoa Program” and also works in collaboration with the Fair Trade Labeling Organizations International.